Selective Call Four Location Kit allows for placing calls directly to any individual room or talking to multiple locations at once. From stylish intercoms to easy internet access, On-Q® communications products provide the features you need to keep your family and home businesses communicating efficiently. Seamlessly blending leading edge technology with stunning design, Selective Call is the most advanced intercom in the industry. The system allows broadcast or room-to-room communication at the touch of a button, and enables up to three simultaneous, private conversations – the only intercom in the industry to do so. And it’s all based on efficient Cat 5 wiring – just what you’d expect from the industry leader. 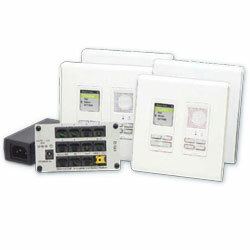 The Selective Call Intercom System combines innovative technology with elegant design. 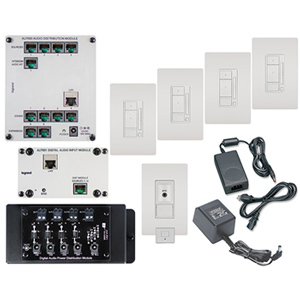 This four-room kit enables broadcast or room to room communication, and allows up to three simultaneous, private conversations. Based on the innovation you’d expect from On-Q®, installation is simple and efficient, with unit auto-discovery and a convenient RJ45 connection.